I got up early and we to water aerobics with Gloria this morning. I was nice to get up and actually get some real exercise in. It is a group of older women that have been doing this forever and Gloria is the instructor. I wasn’t doing all the moves but I did keep moving for 45 minutes so I felt better. We toured around the town of Burlington this morning, seeing the nuclear power plant, the dam and the little downtown. We had lunch in a small antique store that also is a lunch spot. You eat at the tables that are for sale and there is merchandise on the tables where you eat. Very quaint and the food was great. We arrived back at Gloria’s home and Paul was ready to operate some of her machinery! He likes to start the equipment but he wasn’t really interested in mowing her yard! 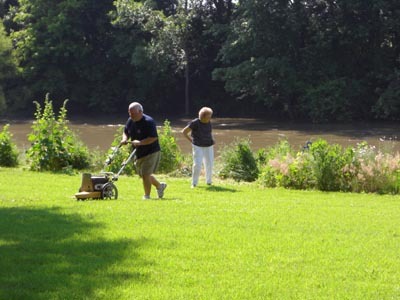 I think she mow’s about 3 acres – it looked beautiful and way more mowing than Paul and I are interested in! Stop! you are mowing flowers! Paul wanted to operate the weed mower however Gloria wasn’t sure she wanted the help! Apparently Paul wanted to take down all the flowers and weeds along the bank of the river. We left Burlington around 2 pm and headed for I-70. Last time we were on this road you couldn’t see for the wind and blowing snow. Today was a little different. Just before we were going to stop for the night in Western Kansas the clouds got really dark and thunder storm warnings started popping up on the radio. We stopped at a rest stop about 7:30 and it was beautiful so we decided to drive about another hour and stop for the night in a RV park we had found. As soon as we got back on the road the wind started, then the lightening and then the rain. I don’t know how Paul kept it between the lines but he did and we found a Walmart! That is where we will stop and watch the storm. It is beautiful. The lightening is all around us so the sky is lit up, the rain is coming down sideways. I sure hope it stops before I need to sleep cause the RV feels like a boat right now! We were up early this am so that we could get on the road by noon. 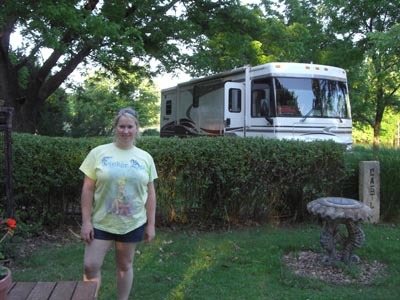 We have been here in Branson for 3 months and there was some cleaning on the RV that needed taken care of before hitting the road. There has been so much rain and wind that our awnings were a mess so Paul got on the ladder and washed them down. We were ready to hit the road just after noon and it was time to say good-bye to our new friends. We will miss everyone but we will be back soon and I am so looking forward to seeing everyone at home. We will take 2 weeks to get to Santa Barbara and I am going to have to hold myself back from trying to rush the driving! Our first stop on our trip home was to Burlington, Kansas to visit my friend, Annie’s mom! She has a beautiful home on the river with plenty of space for our home. We arrived around 7 pm and had time to look around the property before dark. It is really peaceful here and we could stay awhile and just settle into the little town. Stephanie wasn’t so sure about the smallness of the town even though the neighbor had several beautiful horses as well as a baby!